Attracting and retaining the best talent isn’t all about spending money or offering perks. These matter, but the key to building a long-term pool of amazing talent is employee engagement. Attracting and retaining talent frequently hinges on employee engagement. Research shows that engaged employees believe in their work, their supervisors, and their organizations. It’s entirely possible for employees to be happy and satisfied yet unproductive and willing to look for new opportunities. But engaged employees are more than happy or satisfied. They are productive, committed, and loyal. A startling 23 percent of employees voluntarily leave their jobs due to lack of development and training, according to the National Research Business Institute. As the workforce skews younger in the next 20 years, this trend will continue. Here’s the good news: creating employee engagement isn’t as difficult as you might think. This guide explores three ways that investing in online learning through LyndaCampus can help you boost engagement, cultivate positive relationships, and build productive teams. Disengaged employees cost an organization approximately $3,400 for every $10,000 in annual salary—and the American economy up to $350 billion per year due to lost productivity, according to McLean & Company research. 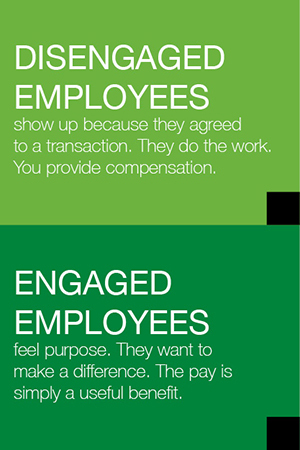 Organizations with engaged employees make more money than others, have less turnover, and experience less absenteeism, according to Gallup. Keep your finger on the pulse of employee moods. Be wary of increased absenteeism, a rise in unproductive conflict, or a new tendency toward risk aversion. When you see these, it’s time to take action. Through observation, developmental conversations with your team, and formal study, identify major impediments to healthy engagement. Then adjust resources to address the opportunities you’ve uncovered. Online learning that is available on demand is one of the greatest developments in employee engagement in the last decade. Online learning can deliver huge impacts in three key ways. Trust, fair treatment, and recognition of contributions are pillars of professional relationships. Providing access to online learning proactively demonstrates trust and fairness. And it enables recognition. You trust employees to log in as needed without the oversight of a traditional instructor hovering nearby. You demonstrate fairness because a quality tool is available to everyone. And you provide recognition when you congratulate employees for course completions or training accomplishments. In addition, effective online learning supports managers as well as employees who aspire to leadership roles. It’s widely accepted that a top factor influencing employee engagement is an employee’s relationship with their direct manager. Leading online training providers cover new manager skills, team-based skills, and executive level topics. Managerial transparency, leaders who model the way, and intrinsic employee motivation are pillars of a strong organizational culture. In addition, a strong work culture is built on transparency. When every employee is well informed with access to information, trust is maintained. To build a strong culture, share all strategic plans as well as revenue and profit information in a timely manner. Informed employees are more engaged. Include employees in the decision-making process. Employees want their voices to be heard. Use surveys or focus groups to represent an employee base. Transparency: widespread knowledge of what is happening in the organization and why it is happening. Provide access to the leadership team. Hold town hall meetings. Take questions. And be held accountable. Prepare managers to answer tough questions and address employee concerns. Offering online training demonstrates support for intrinsic motivation—the tools meet individual learner needs—and allows leaders at all levels to transparently broadcast their course completions, which models productive behaviors. Specific course content helps practicing managers understand culture and how to shape it in ways that support employee engagement. Offering online training demonstrates support for intrinsic motivation—the tools meet individual learner needs—and allows leaders at all levels to transparently broadcast their course completions, which models productive behaviors. Specific course content helps practicing managers understand culture and how to shape it in ways that support employee engagement. Research shows professionals want career development instruction and resources. One of the primary reasons employees stay with an organization is opportunity for growth and advancement. Employees want to understand what is available in their organization to help them develop their career, and the best way to provide this understanding is through formal career planning. When employees believe you are invested in their careers, they become more personally invested in your organization and are more likely to embrace a long-term future there. Effective online training helps employees develop their goals and career paths, and it provides supervisors with the coaching insights needed to help employees with career development. Online learning originally was sold as a quality, cost-effective way to teach skills. Today, we know it’s that plus much more. We have a greater understanding of the deep relationship between online learning and employee engagement. Offering quality online instruction tells employees you’re serious. Serious about learning. Serious about their development. Serious about retaining them and their talents. Employees are paying attention and falling in love with online learning. When you can offer high-quality expert instruction 24/7 on any device, tailored to specific learner interests and needs, why wouldn’t you? That’s how your up-and-coming workforce sees it. They expect access to online learning like they do a desk and computer. Since 1995, Lynda.com has helped students, leaders, IT and design pros, project managers—anyone in any role—build software, creative, and business skills. They work with the best instructors and tout production standards to be second to none. And with training that is quick to market, they have grown their online video-based content library to include thousands of engaging courses. Now a LinkedIn company, Lynda.com serves more than 10,000 organizations. With offices on four continents and tutorials in five languages, lynda.com is a global platform for success. Take a deeper dive, and see for yourself. Check out the lynda.com course, Motivating and Engaging Employees. For more information about LyndaCampus at UNT for employees, please contact Human Resources, CLEAR or University IT.